A Collin County grand jury has asked the Travis County District Attorney’s Office to provide jurors with the results of its investigation into securities law violations by Texas Attorney General Ken Paxton, according to a letter that I received this afternoon. * If the grand jury has gone rogue, that cannot bode well for Mr. Paxton or Collin County DA Greg Willis, who appears to be stonewalling the case against Mr. Paxton. I filed a bar grievance against Mr. Willis because of his flagrant conflict of interest on March 21, 2015, and last Friday the Dallas Morning News called for the appointment of a special prosecutor, yet Mr. Willis refuses to budge. Meanwhile, Mr. Willis and Mr. Paxton appear to have garnered the interest of the feds. Last week, I reported that a federal prosecutor in Plano had referred my blog post about Mr. Paxton and Mr. Willis to the FBI. Today, the prosecutor informed me that he had also referred the case to the IRS Criminal Investigations Division. That makes me nervous, and I’m not even under investigation. On the other hand, nobody at the Collin County Courthouse wants to lift a finger. I sent a letter to Collin County’s nine district judges on March 25, 2015 asking them to appoint a special prosecutor or convene a court of inquiry. Any of them could have done that, but all of them have remained silent. And while I am encouraged by the fact that grand jurors are showing some independence, I’m getting tips from inside the courthouse indicating that Mr. Willis’s assistants are actively trying to lead the grand jury off the trail of Mr. Paxton. It’s hard enough for a lawyer to fight a crooked prosecutor (and I speak with some experience), but it would be a lot harder for a group of average citizens to outmaneuver a prosecutor. I cannot offer details of the tips that I have received because I do not want to burn a source or get someone in trouble, but you can tell from the public record that Mr. Willis’s underlings are trying to bury the case. On the day that Travis County prosecutors announced that they were referring the matter to Collin County, First Assistant DA Bill Dobiyanski refused to tell the Dallas Morning News whether his office was investigating. I called Mr. Dobiyanski back several weeks later and got the same non-answer, which prompted my original letter to the grand jury and related blog post. As I noted at the time, there was no reason for Mr. Dobiyanski’s secrecy, as Travis County had announced months earlier that it was investigating Mr. Paxton for securities violations. It wasn’t until the Houston Chronicle weighed in on March 30, 2015 that Mr. Dobiyanski admitted that there was no investigation. Mr. Dobiyanski also claimed that his office lacked the capacity to investigate the case on its own. According to the DA’s own website, however, the office has 24 badge-wearing, gun-toting investigators. Two of those investigators, Steve Goodman and Greg Bowers, are assigned to the Special Prosecution Division, which “investigates and prosecutes financially motivated criminal activity, organized crime, public integrity matters, and other complex or sensitive cases assigned by the Collin County Criminal District Attorney.” Mr. Dobiyanksi and Mr. Willis should tell the truth: they have the capacity to investigate Mr. Paxon, but they don’t want to do it. And besides, there really isn’t much to investigate. As I explained in my original letter to the grand jury, Mr. Paxton signed an agreed order with the Texas Securities Commission admitting that he had solicited clients without being registered with the commission. That’s a third-degree felony, and it could not have been an honest mistake. While he was a legislator, Mr. Paxton had twice voted for the law that criminalized his own conduct. Yet he violated the law repeatedly, even after he was sued in 2009 by some of the clients whom he illegally solicited. Several state legislators have cited the Paxton / Willis fiasco as a reason for opposing legislation that would transfer public integrity prosecutions from Austin to DA’s offices around the state. I agree with them. I have long thought that all of the state’s voters – not just the ones in Austin – should get to decide who prosecutes public corruption cases, but legislation by Senator Joan Huffman (R-Houston) would only add more layers of bureaucracy (and more hometown favoritism) to the process. 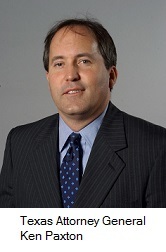 Senator Kel Seliger (R-Amarillo) has proposed that Texas Rangers conduct public integrity investigations, with special prosecutors appointed by the chief justice of the state supreme court. I like Senator Kelliger’s proposal, but naturally I prefer my own: a bipartisan public integrity commission that appoints prosecutors and investigators to pursue corruption cases (I have also suggested legislation to protect the independence of grand juries). In my post about the indictment of former Governor Rick Perry, I observed some of the inherent dangers with special prosecutors: once they are appointed, special prosecutors answer to no one and have every incentive to prolong their cases, often at enormous expense to taxpayers. Attorneys need to be answerable to clients, and prosecutors (special or otherwise) are no exception. I understand the nostalgic reasons for wanting to assign public corruption cases to the Rangers, but I don’t believe the Rangers are the best choice. I have worked with several Rangers, and they are some of the best criminal investigators you can find, but most Rangers will tell you that white collar matters are not their area of expertise. Whereas the FBI recruits lawyers and accountants, Rangers must begin their careers as state troopers and spend at least eight years with the Texas Department of Public Safety before being considered for appointment as a Ranger. That alone limits the recruitment pool, but recruits have no guarantee that they will ever become Rangers. In fact, the odds are against it. At any given time, there are only 150 Rangers, and that’s in a state with more than 27 million people (we had more Rangers when Texas was an independent republic). These 150 men and women spend most of their time investigating murders in rural areas and small towns or investigating use of force by other law enforcement officers, yet somehow they are expected to find the time to investigate public corruption cases all over the state. Even if they were all trained to investigate white-collar crimes, we would not have enough of them to do the job. Governor Greg Abbott has made ethics reform a top priority of this legislative session, and he deserves kudos for that, but I hope he doubles down. Those of us in the GOP had better set our house in order fast, or somebody else will do it for us. 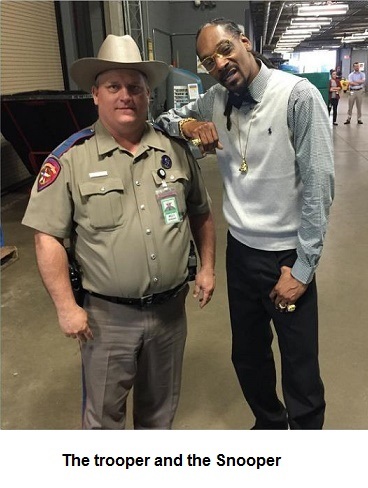 – I have asked state legislators to introduce a resolution in support of my friend and client Billy Spears, the state trooper who was disciplined for allowing himself to be photographed next to Snoop Dogg (you can see another scandalous Billy Spears photo by clicking here). Billy’s story was picked up as far away as India, Australia, and Africa, but none of our elected officials in Texas had any comment. DPS commanders made our state look ridiculous, and they show no sign of backing down. I hope that Governor Greg Abbott and/or our legislators will make themselves heard. You can contact Governor Abbot via his webpage, or you can find your state legislators on the legislature’s website. – For years, I have toyed with the idea of starting a non-profit organization dedicated to fighting public corruption, particularly judicial corruption. Even Judicial Watch has abandoned the latter issue, probably because it gets so much of its revenue from attorney fee awards in Freedom of Information Act cases (I’m not knocking JW for making that decision, because its FOIA cases have done enormous good, and you can’t be fighting judges and expect them to award you attorney fees). I don’t have the expertise – or the money – to start such a group, but I have to think that other lawyers might be interested, as well as potential donors. If you want to brainstorm, shoot me an email at tyclevenger at gmail dot com. – Several sources have told me that my figures were wrong on the suspicious real estate deal involving the Willis / Paxton business partnership, and they are probably right. Specifically, I was told that the original sales price on the 35-acre tract was more than the $155,000 on the deed, while the $7.3 million figure on the subsequent deed included the loan amount for construction. We won’t know for sure until the transaction records are produced. Even using the most conservative figures, however, it appears that the property – which was in a declining part of McKinney – appreciated at least 50 percent in the 19 months before it was publicly announced as the site of the county’s new appraisal district building. That still doesn’t pass the smell test. * In the letter from the grand jury (which I redacted), the vice foreman asked that the recipients keep its contents confidential. I truly mean no disrespect to the grand jurors, but the public has a right to know what is going on, particularly when the DA appears to be stonewalling the investigation. This seems to be what is happening here in Calcasieu Parish. We are tired of the corruption and tired of getting treated like hard criminals when all we want to do is feed our families. They are the true crooks and should be held accountable, just as they hound me for a damn bulb being out over a license plate!! !